Product #18284 | SKU SACC-2-IM2050-BLK | 0.0 (no ratings yet) Thanks for your rating! 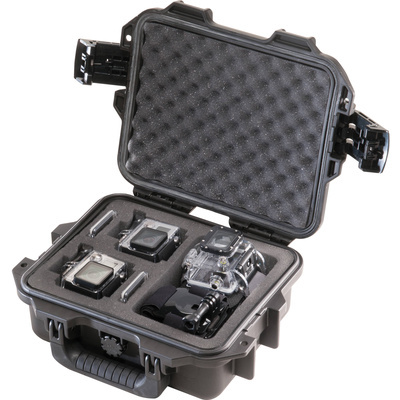 The black Pelican IM2050 Storm Case for Two GoPro HEROs features the same HPX resin hard shell as the standard Pelican Storm IM2050 but includes a pre-cut foam interior designed to hold two GoPro HERO action cameras and various accessories. The case is designed to be dent- and shatter-resistant, and will remain watertight even if briefly submerged underwater. There is a permanently attached Vortex Valve that automatically adjusts air pressure without letting in water, and won't unscrew from the case. Press & Pull latches open with the push of a button, yet are designed to stay closed securely under impact or stress. The case has molded-in hasps that allow the addition of standard size padlocks for added security. The hinges integrate feet that create a flat surface for upright stability. Finally, the case features a double-layered, soft-grip, solid-core handle designed to provide a secure grip when carrying it around.